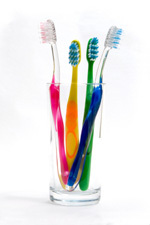 There are many different types of toothbrushes to choose from and each brush has a different type of bristle! When buying a toothbrush, everyone here at Carlyn Phucas Orthodontics thinks you should know the bristles are your number one priority… then consider color, shape, and all the whistles and bells manufacturers use to lure you to buy their product. There are generally three different types of bristles: hard, medium, and soft. We always recommend our patients, especially children and seniors, use a soft bristled toothbrush. This is true for a hand held as well as an electric toothbrush. Why? Because using a hard and medium bristled brush can cause problems with your teeth and gums. If the bristles are too hard, they can wear away the enamel on your teeth and irritate the gums so they become red and sore. Over time, the wrong bristle can even cause your gums to recede. Using the correct bristle will also help slow down gum recession due to the aging process that occurs slowly throughout life, even when correctly using a soft bristled toothbrush. Taking preventative measures now to protect your teeth and gums, will pay off over a lifetime. Soft bristles are much gentler when brushing your teeth and are especially recommended for children, seniors, and patients wearing braces. Children tend to brush back and forth over their gums and teeth with incorrect brushing technique that can cause problems. Seniors are already experiencing gum loss due to aging and hard bristles can speed up the process. Patients wearing braces can bend wires or damage the attachments holding a wire in the orthodontic brackets. This can effect treatment results and may require and additional trip to the orthodontist to correct the problem. Soft bristles, and even extra-soft bristles are every bit as effective when it comes to cleaning your teeth; in fact, the next time you go to buy a toothbrush, try a soft bristled brush. We bet you won’t be able to notice a difference! You are always better off safe than sorry… so buy a soft bristled toothbrush for yourself and everyone in your family from now on if you don’t already. Contact our office with any questions that you may have.